A crowd gathered by the Belmont Ministry Center Wednesday morning to witness Brad Paisley break ground on The Store, a new nonprofit grocery store. Founded by the Paisleys in partnership with Belmont, the 12th Avenue South space will run as a free, referral-based grocery store for those in need, allowing them to shop with dignity. 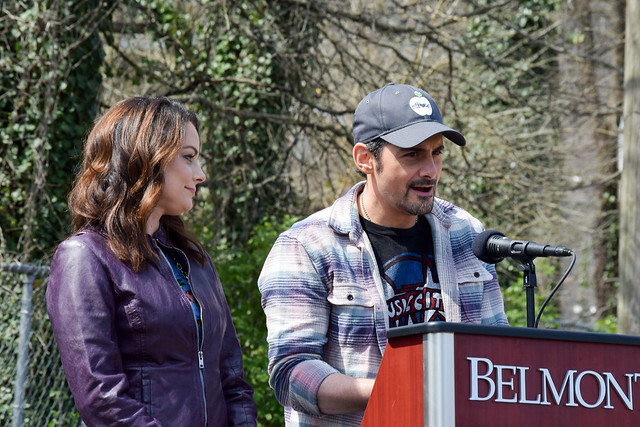 Brad and his wife Kimberly Williams-Paisley spoke at the groundbreaking before he operated the digger that took the first scoop of the new construction, while his song “Mud on the Tires” played in the background. “I really think about the gift that this can be, both to the school that gave me everything and the town that has given me everything,” said Paisley. As a Belmont alumnus, Paisley wanted to create opportunities for current students to serve those in need, something he wished he had done more of during his college years. The concept for The Store came from the Unity Shoppe, a free grocery store in Santa Barbara, California. “You can read everything about this subject and never necessarily have it hit you in the heart like watching someone walk through this service,” he said. The Store will soon provide Belmont students with plenty of volunteer opportunities. “We anticipate our students, faculty and staff will be a major source of volunteers for the ongoing support of The Store’s operations,” said university President Dr. Robert Fisher. Along with volunteers, donations from the community will allow the service to flourish. The Paisleys announced the launch of a brick campaign that allows for donors of $500 to have their name on a brick that will be visible in The Store. “I think we have a power in Nashville in terms of benevolence of the people that live here and the giving spirit of this town,” Paisley said. He noted that the service was named intentionally so that shoppers can say, “Come on, we’re going to the store,” and have it be a normal, dignified interaction that will take the stress off parents trying to provide for their families. “We want to help people in this gap — where they’re trying to get back on their feet and they just need a little bit of extra help,” said Paisley’s wife Kimberly. The Paisleys, joined by Fisher and members of The Store’s board, donned hard hats and stuck their shovels in the dirt to celebrate the beginning of The Store’s construction — and the opportunities it will provide for Nashville. This article and photos by Sarah Crawford.